On the RFID Toys forum, I’m always fielding questions about RFID basics and helping educate people about RFID applications. I also get a lot of questions about where to find cheap gear. I was hoping to be able to answer some of those questions by pointing people to www.ananiahelectronics.com. Will I be able to confidently send people there to buy cheap RFID gear? The answer is a solid yes. The system (reader & tags) is really quite basic. 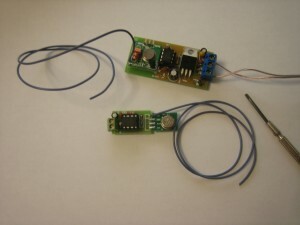 It addresses the rudimentary requirements of an active RFID system by tying simple 315MHz transmitter/receiver modules with a basic 8 pin PIC processor to send out a raw data stream over the air. No fancy data protocols, just raw data transmissions. Simple, yet effective. 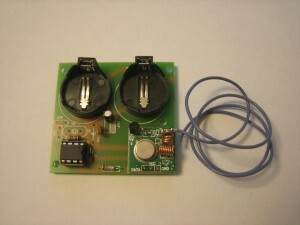 In this review, I take a look at the RF8315R receiver module, RF40315T tag, RF40315Ts tag, and RF40315T-x tag. First let’s take a look at the reader module. 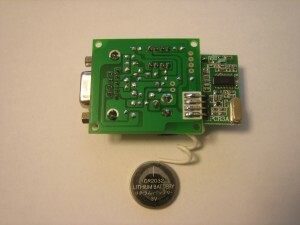 The reader module itself appears to be the same basic design as the tags; 315MHz receiver module married to a PIC based data processing system. 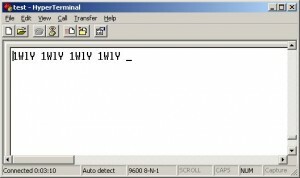 The receiver connects to a host PC via RS232 serial and should be able to support reading and reporting up to 160 tags. Attached to the reader was a coiled 9″ wire antenna (1/4 wave @ 315MHz), which is the recommended antenna length. 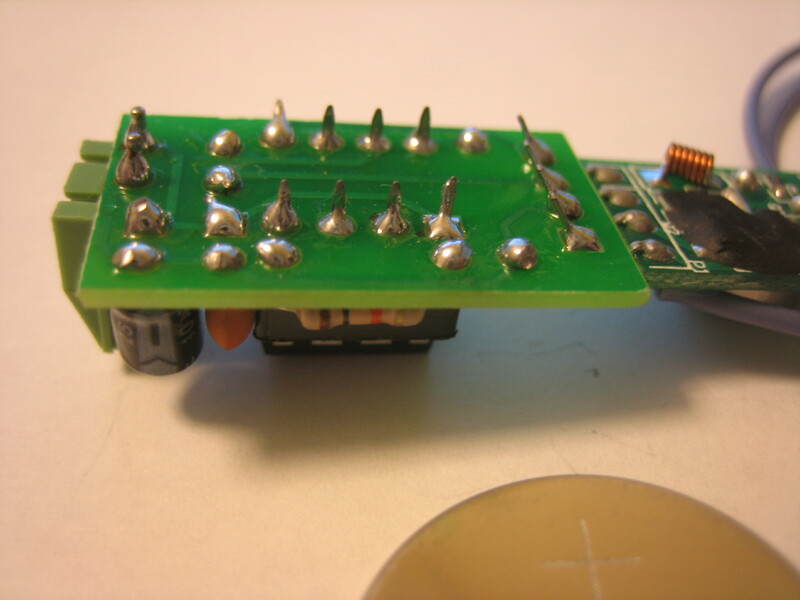 Something interesting I noticed that on the reader circuit board are what appears to be circuit paths and silk screening for a second receiver module. They do supply a 433MHz version as well, so perhaps the reader was designed to be able to listen for both 315MHz and 433MHz tags? Who knows, but I was definitely tempted to find out what connecting a TTL data source to the data pad on the reader board would produce. 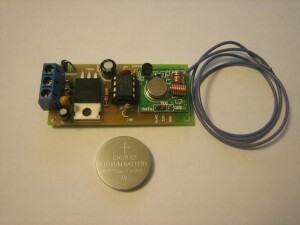 After connecting the reader to PC, I connecting an external 12v power source, and fired up Hyperterminal (9600,8,N,1, Hardware F/C), and put some CR2032 batteries into the RF8315T “40 meter” tag. Like the reader, the basic design is a 315MHz transmitter tied to a PIC processor programmed with a 4 character ID and some kind of transmitter timer algorithm that triggers data transmission after slightly varying timeout periods. This simple anti-collision method helps protect against transmitters talking over each other if two or more tags happen to sync their transmission times. With the tag and reader sitting on the desk next to each other, I started seeing a data stream coming in from the COM port. This was pretty cool to be honest… a very simple 4 character ID followed by a space. Writing software to listen for and sort tags would be very simple to write. I had a smile on my face for sure. I moved the tag into the next room and still got a data stream, so I moved it down to my garage which has 4 different walls and a ceiling separating my upstairs office from the garage bench. I was still getting a data stream, which is good for longer range projects… but without an RSSI value coming in from the reader, I would need to attenuate the tag antenna (trim it short) to make it useful for shorter range applications. What I found was that while the reader comes with a 9″ length of antenna wire attached, the tags come with a 15.5″ length of wire. Trimming this wire on the tags down to 9″ almost completely obliterates the tag’s effective range. So, if you do plan on trimming the tag antenna to reduce it’s range for short range applications, I would proceed cautiously and trim very small segments at a time… that, or consider purchasing some of the short range tags available. But, if you do trim the antenna wire down too far, never fear… just cut yourself a 15.5″ piece of standard stranded copper wire and replace the ruined antenna. To help against possible interference issues, I removed the batteries from the RF40315T tag and grabbed my DC power supply to test the other two tags I had. 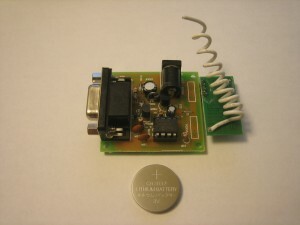 I tested the RF40315Tx tag first because it has it’s own voltage regulator and the DC power supply on my computer desk only has crappy unreliable analog meters on it and I didn’t have my digital voltmeter handy. 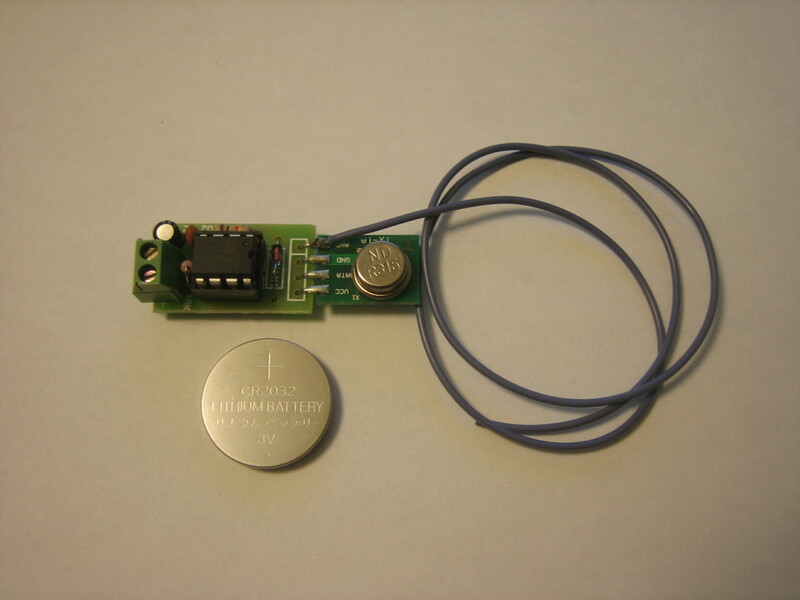 The RF40315Tx tag would be great for large asset monitoring, like putting it in your car or motorcycle. Not only could you keep a log of when the car left the area and came back, you could create some simple alarm software so if the car or motorcycle left your garage between 11pm and 6am an alarm would sound or at least send an SMS txt message to let you know. My last tag to check out was the RF40315Ts tag. With no onboard voltage regulator I went down the the garage and grabbed my old fluke voltmeter and dialed in the voltage on the DC power supply. After connecting the tag to power, data started flowing. This tag was similar in range to the other two tags, but I did notice it had difficulty registering at long range when other tags were transmitting as well. I did notice that the through-hole soldering and component placement on all three tags and the reader itself would not pass in a US manufacturing facility… but the tags and reader I received are working perfectly as advertised so I can’t complain. Definitely, the price/performance ratio works for me! The bottom line is; if you need basic active RFID functionality in an OEM module, these things can’t be beat for the price. If you need something with more features, security, or commercial grade encasement options, you’ll need to spend more dough. This entry was posted on Saturday, October 18th, 2008 at 10:25 am	and is filed under Adventures in RFID, Reviews. You can follow any responses to this entry through the RSS 2.0 feed. You can leave a response, or trackback from your own site.